The US may not stand a chance against Russia and China should World War III break out, advanced warfare analysts have warned. Nonprofit global policy think tank RAND has been performing simulated war scenarios, often sponsored by the Pentagon, to test how American forces would fare against the world's other leading military superpowers. 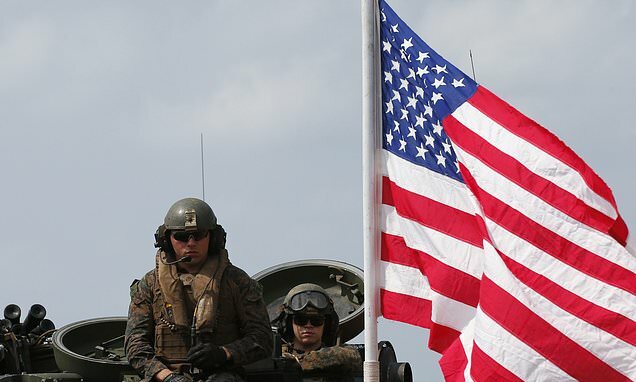 Last week, RAND analysts revealed that in scenario after scenario, the US has suffered severe losses despite spending nearly $1trillion annually on the military, exceeding the spending of any other country by more than double. 'In our games, when we fight Russia and China, "blue" gets its **** handed to it,' researcher David Ochmanek explained at the Center for a New American Security on Thursday, Breaking Defense first reported. American forces are generally color-coded in blue in the simulations. 'We lose a lot of people. We lose a lot of equipment. We usually fail to achieve our objective of preventing aggression by the adversary,' Ochmanek added. Though hypothetical, the simulated games warn that the world order America has fought to protect for more than a century could be at risk. The simulated conflicts take place in all five domains of battle: land, sea, air, space and cyberspace. Accord to RAND, 'red' aggressor forces frequently burn US military bases to the ground, sink warships and take out cyber systems. Robert Work, a former deputy secretary of defense and experienced war-gamer, explained that America's F-35 fighter jet is the most advanced of its kind in the sky, but is vulnerable on the tarmac.